The Wide Field Imager on the MPG/ESO 2.2-metre telescope at ESO’s La Silla Observatory in Chile has taken this beautiful image, dappled with blue stars, of one of the most star-rich open clusters currently known — Messier 11, also known as NGC 6705 or the Wild Duck Cluster. Messier 11 is an open cluster, sometimes referred to as a galactic cluster, located around 6000 light-years away in the constellation of Scutum (The Shield). It was first discovered by German astronomer Gottfried Kirch in 1681 at the Berlin Observatory, appearing as nothing more than a fuzzy blob through the telescope. It wasn’t until 1733 that the blob was first resolved into separate stars by the Reverend William Derham in England, and Charles Messier added it to his famous catalogue in 1764. Messier was a comet hunter and the catalogue came into being as he was frustrated by constantly observing fixed, diffuse objects that looked like comets (for example, objects that we now know to be clusters, galaxies and nebulae). He wanted a record in order to avoid accidentally observing them again and confusing them with possible new comets. 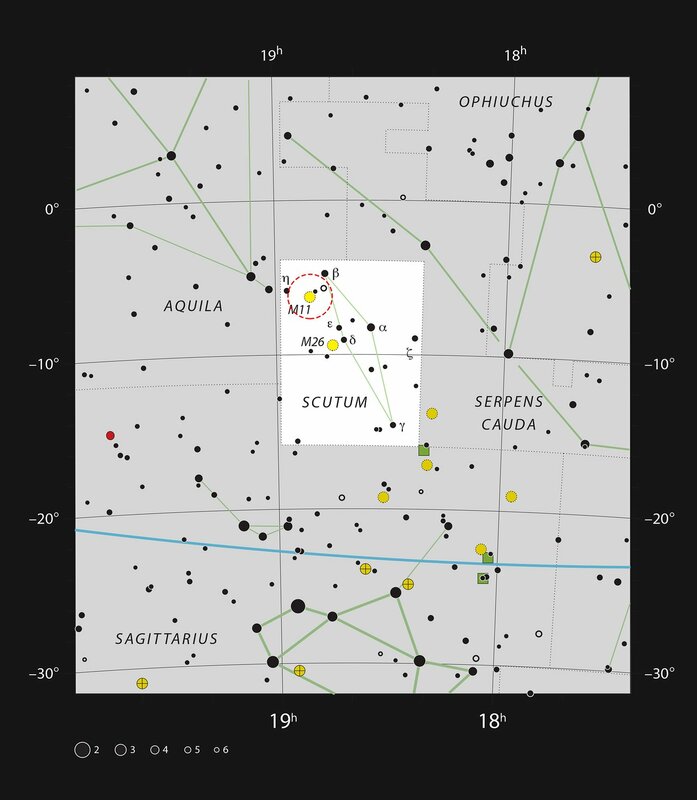 This particular stellar cluster was noted down as the eleventh such object — hence the name of Messier 11. 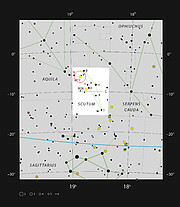 Open clusters are typically found lying in the arms of spiral galaxies or in the denser regions of irregular galaxies, where star formation is still common. Messier 11 is one of the most star-rich and compact of the open clusters, being almost 20 light-years across and home to close to 3000 stars. Open clusters are different to globular clusters, which tend to be very dense, tightly bound by gravity, and contain hundreds of thousands of very old stars — some of which are nearly as old as the Universe itself. Studying open clusters is great way to test theories of stellar evolution, as the stars form from the same initial cloud of gas and dust and are therefore very similar to one another — they all have roughly the same age, chemical composition, and are all the same distance away from Earth. However, each star in the cluster has a different mass, with the more massive stars evolving much faster than their lower mass counterparts as they use up all of their hydrogen much sooner. In this way, direct comparisons between the different evolutionary stages can be made within the same cluster: for example, does a 10 million year old star with the same mass as the Sun evolve in a different way to another star that is the same age, but half as massive? In this sense, open clusters are the closest thing astronomers have to “laboratory conditions”. Because the stars within open clusters are very loosely bound to one another, individuals are very susceptible to being ejected from the main group due to the effect of gravity from neighbouring celestial objects. NGC 6705 is already at least 250 million years old, so in a few more million years it is likely that this Wild Duck formation will disperse, and the cluster will break up and merge into its surroundings . This image was taken by the Wide Field Imager on the MPG/ESO 2.2-metre telescope at ESO’s La Silla Observatory in northern Chile. 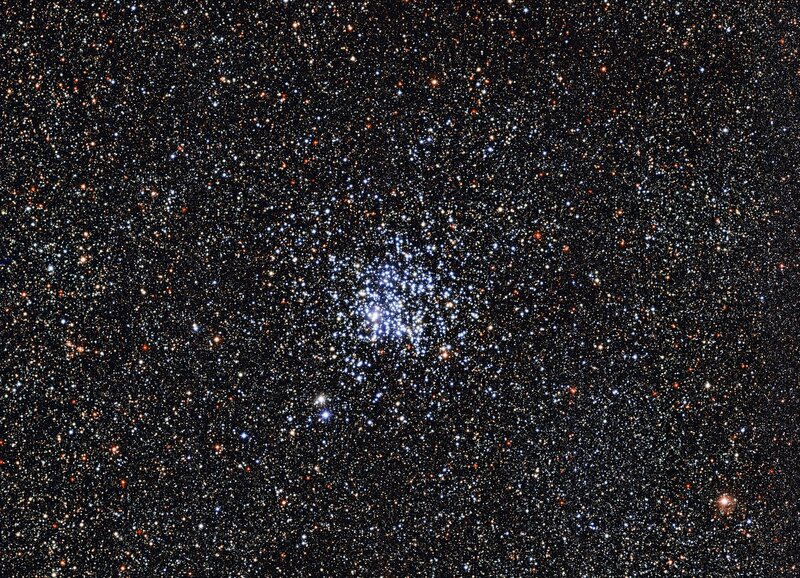 The alternative and evocative name for NGC 6705, the Wild Duck Cluster, came about in the 19th century. When the cluster was seen through a small telescope it was noticed that the brightest stars formed an open triangle pattern on the sky that resembled ducks flying in formation.